Several books follow the footsteps of earlier titles. 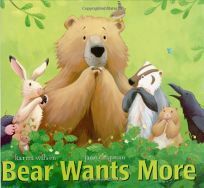 The ursine hero from the best-selling Bear Snores On emerges from hibernation in Bear Wants More by Karma Wilson, illus. by Jane Chapman. The ""more"" he wants is food, of course: ""When springtime comes,/ in his warm winter den/ a bear wakes up/ very hungry and thin!"" His friends are happy to indulge him, but when he heads home, stuffed, he's in for a surprise.